(Like in 2011 and 2012, also in 2013 the yearly Sounding City sound art program of the Flanders Festival in Kortrijk (Belgium), will include a fine showcase of RESONANCE works. Between April 21st and May 5th in Kortrijk you can experience Pascal Broccolichi’s Table d’Harmonie, Jitske Blom & Thomas Rutgers’s The Beaters, and Writings, a new work by Norwegian artist Signe Lidén, that will premiere in Kortrijk. Also a RESONANCE premiere in Kortrijk is David Helbich’s Kortrijk Tracks: a soundwalk. David’s work is the second in a collection of soundwalks for the city of Kortrijk, curated by the Festival’s director Joost Fonteyne, and not only available during the Festival weeks to visitors of the Belgium town, but all through the year. In the following article, Joost provides a historic and artistic evaluation of the soundwalk as a genre. The article previously appeared (in German) as Die Kunst des Soundwalks, in Positionen, number 94, February 2013). Tourist offices will make any effort to seduce people to visit their cities or regions. The key word is experience. Visiting a city needs added value, we have to feel the city. Hip tools such as tablets and smartphones are thrown in to make it happen. In this context also soundwalks have been discovered. Equiped with smart tools, visitors are sent into the city. Just have a look at soundwalk.com to get the idea. Then take e.g. the walk in romantic Paris Saint Germain des Pres. To quote the website: ‘Virginie Ledoyen saunders through the streets once walked by the likes of Baudelaire, Appolinaire, Prévert and Sartre. These wandering ghosts of French poetry lure around here, creating a dreamy atmosphere as she enlightens us with the richness of Saint Germain des Pres. Strolling the streets aimlessly at first, the young beauty is captivated by the aura of a young man…’ Through the app you become part of a cinematic, augmented reality. You boldly go where fellow app-owners have gone before. It’s all nicely wrapped up in an ‘infotainment’ package. The apps are made in a professional way and artists collaborate to make your visit unforgettable. Apparently creative entrepreneurs do good business. Soundwalk.com lists already 32 different soundwalks on their website. And they are not the only providers who make money with these touristic apps. From 2013 onwards, Flanders Festival Kortrijk in Belgium starts a collection of soundwalks for the City of Kortrijk. Also these walks will be quite an experience. And made by artists who will guide people through the city. We start with two walks and in the next years we will add new projects to the collection. Well, we will not make money with it. But most important, the starting point is the production, presentation and promotion of art projects, the work of interesting sound artists and composers. Some people are rather sceptic and raise questions. Are soundwalks sound art? Is the effort worthwhile when ‘deep listening’ as a practice is vanishing? For some academics and professionals sound art relates to the interaction between sound and space and takes ‘installation art’ as a point of departure. This point of view is e.g. deeply rooted in the German tradition of Klangkunst. Personally, this question seems less important. Sound art and consequently soundwalks were revealed to me through musicians who experimented with the boundaries of music. Artists who take music – or let’s call it organised sounds – to another dimension. Out of this grew numerous exhibitions and performances. And a rather childlike definition of sound art: art that makes sound. Not an attempt to make a stirr or to evoke cheap discussion, but a way to not isolate the genre. A way to allow artists who work with sound in a relevant way to be ‘part of the game’. The loss of the ‘deep listening’-tradition is indeed problematic. But let’s elaborate. Is it not a problem of concentration in general? We can easily make an analogy to e.g. ‘deep looking’. The Metropolitan Museum of Arts (New York) found out that the average time visitors watch one painting is 17 seconds. It is even worse in the Louvre (Paris). Leonardo de Vinci’s ‘Mona Lisa’ is worth an average look of 15 seconds per visitor. Of course the enormity of paintings in display does not help. But still, we are talking about exceptional historical world heritage. We are told that we live in a world that sends us thousands of visual stimuli per day. But we hardly hear about the equal amount of auditive stimuli. And even no one seems aware anymore of the auditive quality of her or his direct environment. Maybe, just like Steve Roden in his latest exhibition in Singuhr – Hoergalerie (July/August 2012, Berlin), we should do more 4’33”-practice (in reference to John Cage’s so often wrongly called ‘silent’ piece). Becoming aware of what our lives sounds like. Already, more then a century ago the question about sound awareness was raised. With the industrial revolution from the end of the 19th century onward, our sonic environment has changed drastically. Factories and machinery and its noise were new phenomena. Even to the point where noise pollution and noise itself became a source of inspiration for artists and composers. Next to the experiments of the avant-garde, scientists studied acoustics, psycho-acoustics, techniques of recording and sound analysis. We learned that eye and ear are well connected to perceive our surrounding world. But still today the auditive is underestimated, hence the proverb ‘to see is to believe’. Already in 1916 futurist Luigi Russolo stated that when looking at a landscape painting we miss an important – if not the most important – component: the sound of the landscape. And this is precisely the point where soundwalks can be helpful. Artists who invest in soundwalks – of course also a relation between sound and space – invite the audience to ‘deep listening’. Each in their own way they use techniques to provide a context for listening, to discover sonic environments. This can be done by filtering sounds, being silent and listening, using compositions with city sounds, via the use of ‘artefacts’, adding comments to the sonic environment or narrative elements. In 1974 soundwalk-pioneer Hildegard Westerkamp defined it as following: ‘A soundwalk is any excursion whose main purpose is listening to the environment… The intention of soundwalk is listening. Soundwalks can take place in the mall, at the doctor’s office, down a neighbourhood street or at the bus stop. The focus on listening can make this a meditative activity (…)’. With this quote we plunge in the history of soundwalk. The text ‘Soundwalking: creating moving environmental sound narratives’ by Dr. Andra McCartney (draft for a publication in ‘The Oxford Handbook of Mobile Music Studies’ by Dr. Andra McCartney, Associate Professor, Communication Studies, Concordia University Montréal) is strongly recommended. She brings us to the first use of the term by the World Soundscape Project, under the leadership of composer R. Murray Schafer. Hildegard Westerkamp was a member of this research project that expressed a strong concern about noise pollution. Interestingly enough, her text touches the historical practice of ‘listening while walking (…), as well as practices of walking meditation, in which attention to listening figures prominently’. In the prolongation of this more philosopical approach, it is worthwile to investigate the work of J.F. Augoyard at Cresson (Centre de Recherche sur l’espace sonore et l’environment urbain) founded in 1979. Their research includes ‘acoustic architecture, urban acoustics, anthropology of space, sonic environment, urban sociology, and theories of architectural and urban ambiances. Auguyard is a philosopher and musicologist (…) His doctoral dissertation (…) is a methodogical and theoretical consideration of ways of walking in an urban environment’. Dr. McCartney guides us through the history via listening walks by Gregg Walgstaff, blind walks by Francisco López, electrical walks by Christina Kubisch, the sound pilgrimage of Olivier Schroer, the shadow walks of Viv Corringham, the audio walks by Janet Cardiff and George Bures Miller and finally – the starting point of this text – soundwalk.com. Strange enough her text does not mention the LISTEN-project by Max Neuhaus. From 1966 until 1976 he organised some 15 listening walks in Canada and the United States. In the context of the work of Gregg Walgstaff, Mc Cartney defines listening walks as ‘led by a guide with the intention of encouraging active listening among a wide audience to the surrounding sound environment’. Max Neuhaus’s approach was simular, but different. Het did not add sound to the environment, but unless others he did not have a sound ecology point of departure: ‘As a percussionist I had been directly involved in the gradual insertion of everyday sound into the concert hall (…) I became interested in going a step further. Why limit listening to the concert hall? Instead of bringing these sounds into the hall, why not simply take the audience outside – a demonstration in situ?’ (Max Neuhaus, Listen – 1988, 1990, 2004). In this context he should be added to the historic gallery. But let me take you through a personal history of soundwalks. ‘Electrical Walk’ by Christina Kubisch. In 2005 the exhibition ‘Her Noise’ was organised in London (South London Gallery and Goethe Institut London, 10 November – 18 December 2005, by Electra Productions). It presented the work of female sound artists and musicians, a.o. two ‘electrical’ works by Christina Kubisch. One of them was the ‘Electrical Walk London’. Kubisch develops these walks since 2003 as a result of her research on electromagnetic induction as a sound source for her sound installations since the 1970’s. These sounds emerge by the interaction between magnetic fields, such as electrical wires traversing space in which sounds circulates or selfmade headphones with magnetic coils. In her walks you are equipped with one of these headphones. The headphones respond to the electrical fields in the city environment. Or you could say, they unveil hidden sounds. Experiencing this for the first time is quite a treat. A map suggests listening spots chosen by the artist: ATM’s, shops security panels or tubular lights to give a few examples. Each of them has a specific sound, ranging from respectively white noise, to heavy noise and a string-like sustained sound. The fun begins when you take time to explore it yourself. London – but also Kortrijk where it was presented for the first time in 2007 – has a lot of deep listening to offer. To be continued from April 2013 onwards. plan b are Dan Belasco Rogers and Sophia New, who got to know each other in the British theatre company Reckless Sleepers. Not unimportant to understand their work. Dan Belasco Rogers’s strong interest in sound was presented through performance, while Sophia had a strong performance background. This explains the more narrative and performative context of their projects. Peninsula Voices is a sonic walk through the spaces of the Greenwich peninsula area, London. It talks about the huge transformation of this area through personal journeys of the participants, sounds and comments added by plan b. These form a new map, with sound as guide. The GPS-software triggers the sound: entering a certain spot will distribute the connected sound through headphones. For a few hours you are drawn into the history and the present of this London borough: an abstract narration in a non-linear way. From the rise and fall of the East Greenwich Gas Works with its gas holders to the construction of the much debated Millennium Dome. A similar project was produced by arts centre Buda Kortrijk for the area known as Buda Island under the title Into the Light of the Night (plan b in collaboration with the great Belgian field recording artist Els Viaene). ‘oto-date Na Gi Sa’ by Akio Suzuki. In the summer of 2008 the Japanese artist Akio Suzuki realised for the Singuhr – Hoergalerie his oto-date in Berlin. oto-date is a series of works in which Suzuki only uses the existing sound of different cities. His walk is very close to the soundwalk definition of Hildegard Westerkamp: ‘…any excursion whose main purpose is listening to the environment…’. In the case of Suzuki we need to add: perceive the environment. The 72 years old artist makes ‘audiovisual slices’ of the city. He creates points of listening and points of – literally – view. On chosen spots he paints ears that resemble feet on the ground. By using these positions you enter his world. Two examples make it clear. Suzuki lets you face the edge of a house. With your left eye you look to the street left to you, with your right eye to the street on your right. The same ‘split’ happens in your ears. Next situation: Suzuki offers a close view in front of a tree trunk. Your left eye looks into a street with a tower at its end, your right eye is focussing on the trunk. Again the same dichotomy happens to your ears. This project seems so simple, yet it is so precise. The perception the environment becomes totally different. Regardless if you live around the corner and you have already walked there many times or if you visit the neighbourhood for the first time. ‘The Walk Book’ by Janet Cardiff. 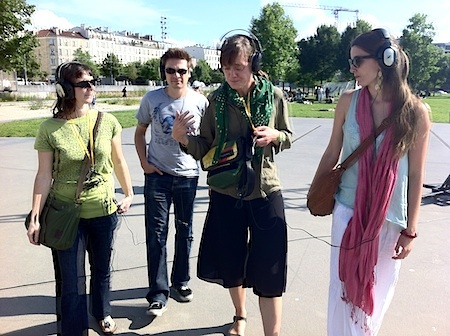 I never had the occasion to experience a walk by Janet Cardiff myself. But this book totally hooked me up. ‘The Walk Book’ is ‘stricto senso’ an art book. It remembers several art projects – immersive walks – Janet Cardiff and George Bures Miller presented in different cities, a.o. ‘Her Long Black Hair’ for Central Park, New York. This publication is a book, a cd, text of the walks, texts about the walks, drawings and inserted photographs. Of course you do not get the real stuff, but Cardiff makes it happen while you are sitting at your table and you listen to her voice, giving instructions to browse the book in a non-linear way. From the moment you hear her voice a mental soundwalk is commencing: ‘Do your headphones on. You won’t get the full effect of the audio unless you do. This is the right ear. And this is the left ear. (…) I’m in Berlin right now, sitting on my coach with the walk book in front of me on the table. Maybe the book is also on your coffee table. Open it up. Turn to page 233. I took this picture of an arrow the other day. I don’t know why it was in the park, directing me as I walked, pointing at things. Like stones and trees. I’m gonna go back there today and see if it’s still there. Now turn to the last page in the book. (Sneezes) Excuse me. I used to collect these types of photographs from detective magazines (…) Put the book down now and go over to your window (…) I woke up really early this morning, this is what it sounded like then. Sit down again, I want to show you something else in the book. Turn to page 121 (…) I want you to walk with me…’ (The Walk Book, Janet Cardiff – cd, track 1). Please do, I can only recommend it. These four projects do work with ‘deep listening’. You need to reserve time to discover them. No hurry. These are not projects that have the ambition to promote a city or a region. They grew out of a necessity of artist and their artistic pratice. They do not have a commercial goal. These projects are reflections, contradictions, comments, raised questions, different points of listening, of view in relation to space, in case the city environment. Please continue dear artists. Doing so is a stimulant to not be superficial, to go deeper. To listen deeper. To look deeper. It’s a pleasure to concentrate on your propositions on our daily environment. On Sunday 21 April 2013 the first two soundwalks for the new collection of sound walks for the city of Kortrijk will be premiered. Christina Kubisch did an update on her ‘Electrical Walk Kortrijk 2007’. The city went through a tremendous change. Blocks of houses were demolished since her first visit in 2007. They made place for a completely new commercial centre. Curious to hear how she will deal with this. The Brussels based artist David Helbich presents ‘Kortrijk Tracks’. It started 2012 with his installation ‘Public Sound: Kortrijk-Jerusalem’ for last year’s edition of Sounding City. The sounds of two totally different cities merged in a field recording composition and was distributed at the entrance gate of the Kortrijk beguinage. For ‘Kortrijk Tracks’ Helbich prepares several tracks, field recording compositions, for different places in the city. These will form a spiral on the city map. A spiral that leads you out of town, or inverse, that brings you from the outskirts to the centre. To be continued. Oh yes, these walks will be available in a permanent way from 21 April 2013 onwards. They will be made available to the audience via … the tourist office. I guess nobody’s perfect. You are currently reading The Art of Soundwalk at Resonance - European sound art network.